Hard to believe that the first time I heard this 8-minute cooking jam from one of the great black power singer/songwriters was five years after it had come out, on the soundtrack to a low-budget sketch flick called "The Groove Tube." By the time I hit college, there were two cheap-o R-rated comedy movies which parodied TV shows, commercials and popular movies that played the midnight circuit -- "The Groove Tube" and "Kentucky Fried Movie." Groove Tube's memorable opening was in two parts, the first parodying 2001: A Space Odyssey, and the second was a loony sketch involving a hitchhiker getting picked up by a hot babe on a California highway and then chasing her through the woods in a twisted version of "The naked Prey" -- all of it done to Mayfield's "Move On Up." There was nothing on screen remotely connected to ghetto struggles or black liberation... it just had a kickin' percussion-driven groove that made for good editing and fast pacing. 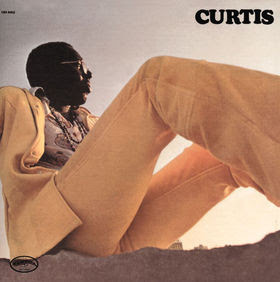 Some years later, I tracked down a used vinyl copy of Curtis down on St. Marks Place and played "Move On Up" at many parties. I loved Mayfield's Superfly soundtrack album, and I can still recite the lyrics to most of those songs today. But "Move On Up" was his extended party theme, something where everybody can join in with that killer minor key horn hook. Where there's only one kind. This song reminds me of many of War's early 70's jam songs, where it was all live, analog, warm and deep. Mayfield's gorgeous falsetto told many tales of hard times and pushing ahead, building on his body of similar themes with The Impressions ("People Get Ready," "We're A Winner," "It's Alright"). Song highlight: after soloing and just letting the percussion and horns carry the beat, the song pauses for a split second, and the horns do sort of a fake major chord coda. You think it's over and them wham, the drums come whirling back in by themselves, lots of cymbals and snares, with the bass and guitar following in a simmer. Yes, this is old school, but crank this at the right time in a club or party, and the place goes into a frenzy. Lucky you, here is the famous R-rated opening sequence for "The Groove Tube," followed by all eight-minutes of "Move On Up," and then Mayfield performing the song live in concert. 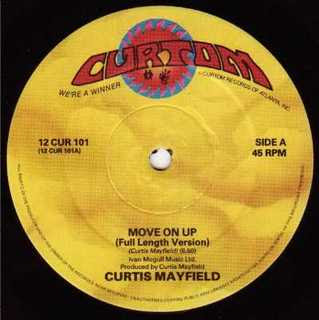 CURTIS MAYFIELD "move on up"
I love Curtis Mayfield. He has always been revered here in England. We Gotta Have Peace is my all time CM song though.